Relay interface: Using 250V 10A relay, you can directly operate most of the electrical appliances on the market. SIM Card Socket: Insert SIM card when system powered off. (In China, please use mobile or Unicom card). LED interface: There are three LED lights named D3 D5 D6 (D5 is close to the positioning hole, D6 is close to the antenna interface). LED indicator state corresponds to the equipment working conditions are as follows, each column is one state. Mode configuration: Format: *code*$00000N $, N=1, 2, 3, 4. 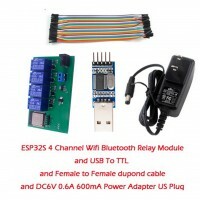 If you want to set this controller work at 1 mode, send the SMS: *123456*$000001$. The device will reply, content is: SYS Mode: 1 Set OK! 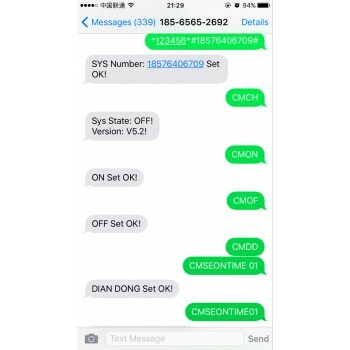 Relay On command: CMON, after successful setup, the device will reply SMS is: ON Set OK! For example, send the SMS: CMON. Relay status will be saved. 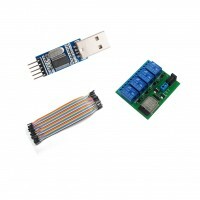 Relay Off command: CMOF, after successful setup, the device will reply, SMS Content is: OFF Set OK! Send the SMS: CMOF. Relay status will be saved. 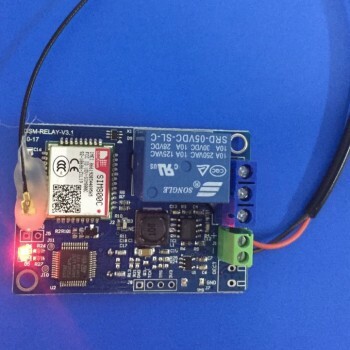 Relay on for only 1-2 second command: CMDD, After successful setup, the device will reply, SMS Content is: Dian Dong Set OK! For example, send the SMS: CMDD. Relay status will not be saved. Relay on for 1-99 minute command: CMSEONTIME(2 bit time), after successful setup, the device will reply, SMS Content is: ON Set OK! TIME ** MIN! The timing range is 1-99 minutes. If you want to control Relay On for 1 minute, send the SMS: CMSEONTIME01. Relay status will not be saved. Remote control: You can control your home devices even if you are in the office.